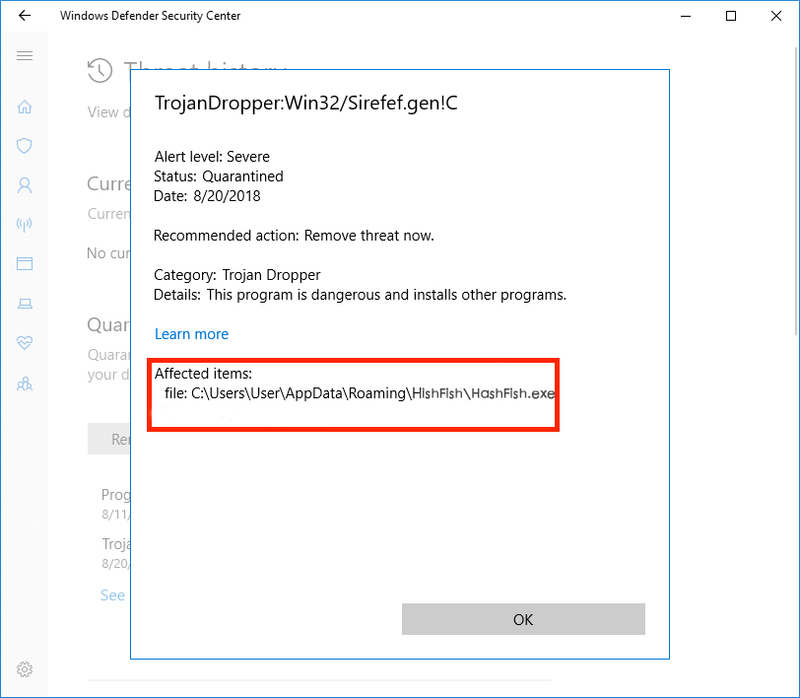 Windows Defender - How to setup an exclusion for HashFish? HashFish runs secured mining applications that have been compiled in-house under thorough review--however some antiviruses may detect that HashFish contains cryptocurrency mining software and issue a false positive alert that it may be unwanted. First, open Windows Defender via your Start Menu by clicking the Windows Icon and typing "Windows Defender". Click "Windows Defender settings". Then click "Open Windows Defender Security Center". Then click "Virus & threat protection". Then under Quarantined Items, first click the dropdown arrow to reveal the "See details" link and then click that. Verify that the file quarantined is a HashFish executable file. You may need to check through a few of these quarantined items (if there is more than one). Once you have confirmed that it is a HashFish executable, click the "Restore" button for that file. You can now toggle mining off and on on HashFish to resume mining.